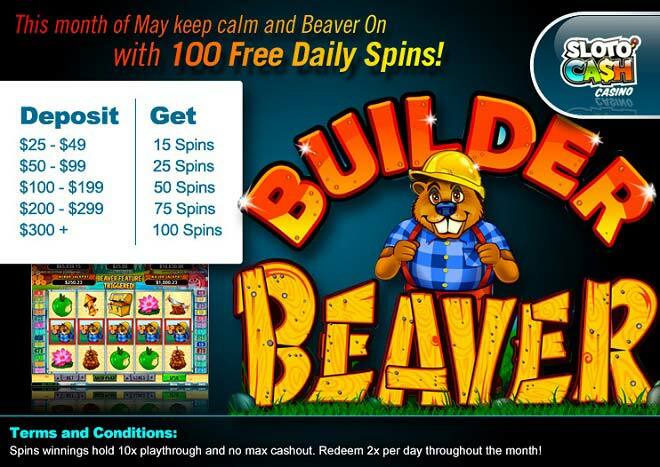 This May Claim up to 100 Free Builder Beaver Spins! Leave the hard working days up to the beaver this May and you just sit back and relax as you collect wins! Deposit as little as $25 and play with up to 100 Free Builder Beaver Spins! Make your way through May by landing three or more of the Wild Beaver symbols anywhere on the reels and playing with free spins. The reels continue spinning for free in a second screen that grants you 12 free extra spins. And to top it off, your wins here will be multiplied times 3! May means a paid vacation for you while the Beavers go out to work and help you win when you deposit a minimum of $25 to play with up to 100 Extra Spins!